The same spectacle repeats itself night after night. 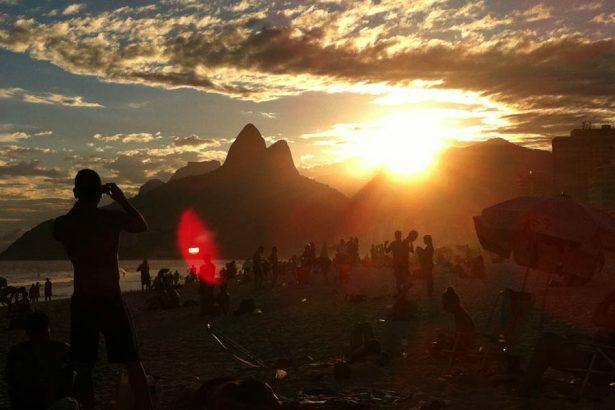 When the sun slowly sets behind the two peaks of the Dois Irmaos and the beach of Ipanema is bathed in a warm, golden light, one wants to capture this moment for eternity. The men are now crowding Rio’s gay beach, a caipirinha or beer in their hands. 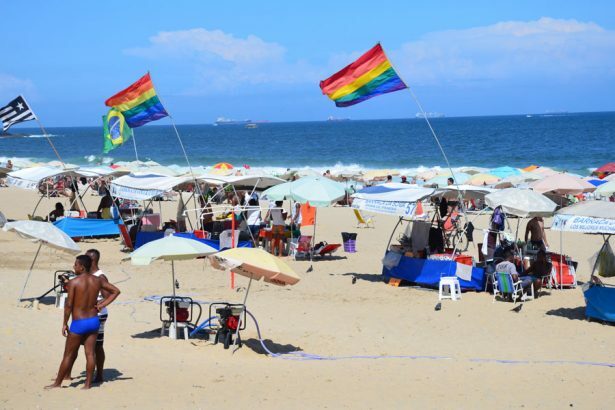 The beach is easy to find near Rua Farme de Amoedo as rainbow flags are raised. It is especially crowded here on a Sunday when many Cariocas – as the locals are called – find time to come to the beach from further away parts of town. They do not bring anything else to the beach than their swimming trunks, sunglasses, sunscreen, a few banknotes and their mobile phone. Towels are frowned upon by Brazilians as is wearing long-legged swimwear. A Carioca shows his assets and on the beach at Ipanema, six-packs and well-trained biceps show clearly that the gym is his second home. 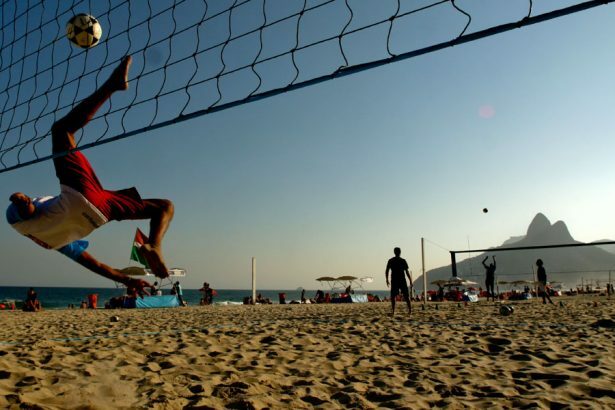 The beaches of Rio are nothing more than a single open-air fitness center. Along the Avenida Vieira Souto there are designated areas every few hundred meters where you can do pull-ups or situps, beach volleyball fields line the beach as well as a wide cycle path. You can run at any time of the day or night anyway. On Sundays, when the roads along the beaches are closed to traffic, thousands of people stroll along the boulevards. 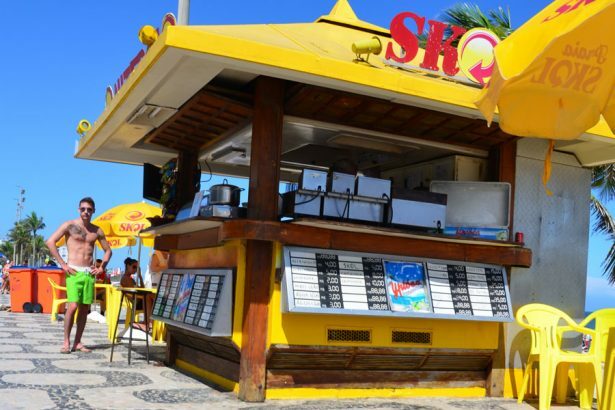 The beaches of Ipanema and Leblon have taken over in popularity the once famous Copacabana. 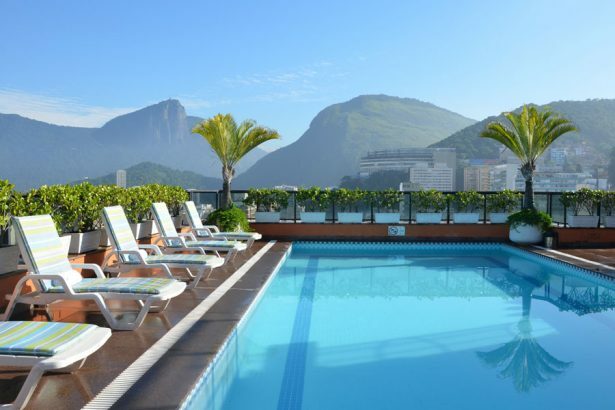 Although hotel giants like the Copacabana Palace still bear witness to the former fame of the legendary beach, the rich and beautiful have long since moved to the neighbouring and far more beautiful neighbourhoods. In Leblon, along Rua Dias Ferreira, you will find some of South America’s best restaurants, over 30 bars and restaurants in a row. A popular homo party takes place on Sundays at Zero Zero in the foyer and garden of the nearby planetarium,, where a colourful mixed crowd parties until dawn. Big clubs like Cinea Ideal, where muscular boys romp around on the dance floor half-naked, are located in the centre of Rio off the beaches. 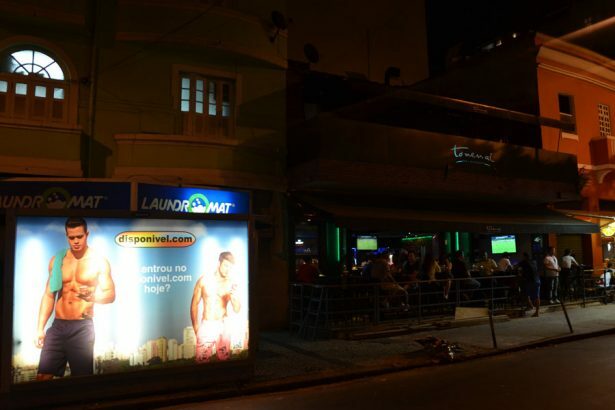 In Ipanema and on the border to Copacabana the bars and clubs are smaller. After sunset or when a rain shower drives the crowd away from the beach, the bars along Rua Farme de Amoedo fill up. The To Nem Ai is such a refuge, which is also ideal as a starting point for an excursion into the nightlife. You shouldn’t go to one of the clubs like the quite alternative but very pleasant TV bar before 1a.m. 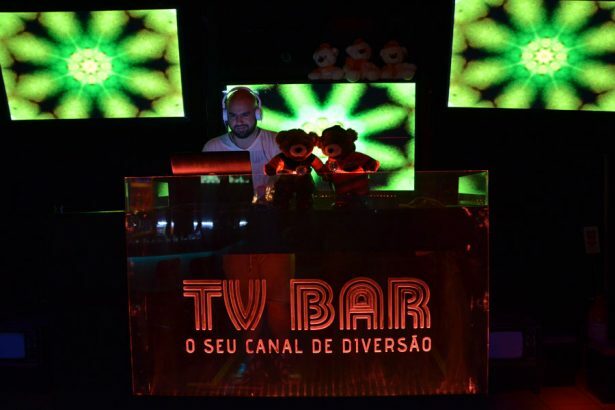 A classic of the gay scene is Le Boy, probably the most famous gay club in the city, which is especially popular with tourists and young Brazilians, also because there is a sauna in the same building. Cariocas prefer the Galeria Café – a rather small club in Ipanema, where there is hardly any space left at late hours. 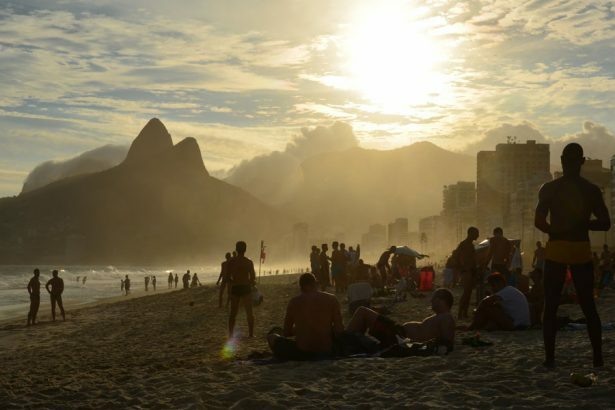 Even if Brazilians from São Paulo rather smile at the scene in Rio – for a tourist, the city has more to offer in terms of gay scene than one can cope with on two weekends. 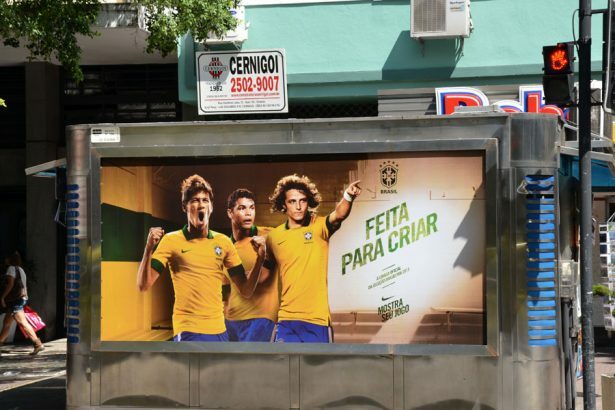 At least in the neighbourhood of Ipanema and Leblon, the streets connecting the various locations are much safer at night than a few years ago. In the run-up to the World Cup and the Olympics, which will be the focus of worldwide attention in the coming years, the city has done a great deal in terms of security. A dedicated department within the Town Hall is also responsible for gay, lesbian, bisexual and transgender affairs. In Rio, one of several Brazilian states that allows homosexual marriage, there are emergency numbers for homophobic assaults and a kind of task force that acts on suspicion of discrimination – be it at the workplace, in hotels or in public spaces. Rainbow-coloured signs found all along the beach of Ipanema explicitly point to a ban on discrimination on the grounds of sexual orientation. Even if it is difficult to turn your back on the Gay Beach for a day, a few excursions to Rio’s sights are worthwhile. If the sun is shining and if the statue of Christ on Corcovado is visible from the beach, you shouldn’t think long and make your way up the mountain. A cog railway, which was put into operation in 1884, takes you up there through the rainforest. Especially in high season you allow enough time or leave early in the morning or late in the afternoon. The panorama with Sugarloaf, beaches and a lagoon visible on a clear day is unique and the view from definitely not to be missed. 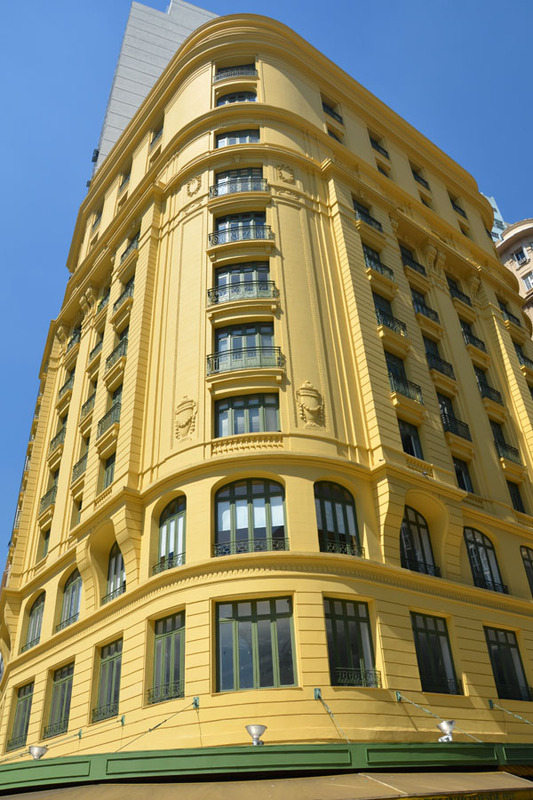 On a walk with a tour guide from “Rios de Historia” you can learn more about the history of the city, stroll through palaces, baroque churches and narrow old town streets, past the imposing Teatro Municipal and the famous Art Nouveau café Colombo. Rios de Historia also offers excursions to neighbouring Niteroi, to the German-influenced Petropolis or to one of Rio’s numerous “Comunidades”, as social projects in the favelas are called today. Once you have successfully completed your excursion itinerary for day there is nothing left to keep you from your evening ritual: Get into your swimming trunks, off to the beach, buy a caipirinha or a beer and don’t miss the sunset. Official homepage of Riotur containing useful information and an events’ calendar. Lufthansa offers daily flights from Frankfurt to Rio de Janeiro. Return flights are available from 990 Euros in Economy Class. Keep your eyes open for special offers on the airline’s homepage.